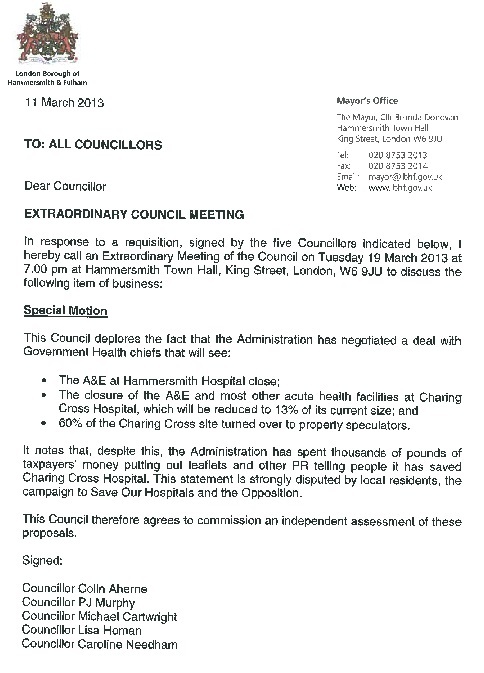 The Cowan Report: Labour Calls A Vote For Independent Assessment Of Conservatives' Hospital Cuts Plan At Next Week's "Extraordinary Council Meeting"
Labour Calls A Vote For Independent Assessment Of Conservatives' Hospital Cuts Plan At Next Week's "Extraordinary Council Meeting"
The Labour Opposition on Hammersmith and Fulham Council have called an emergency council meeting to discuss the private deal Conservative Councillors struck with government health chiefs at the end of last year - as reported here. 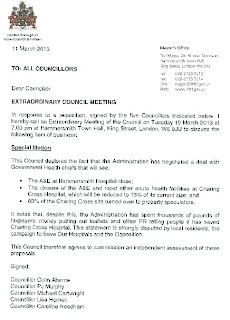 The Mayor has scheduled the Extraordinary Council Meeting for next Tuesday, 19th March. It will begin at 7.00pm in Hammersmith Town Hall. You can view the agenda by clicking here. My Labour colleagues and I called this vote as we believe that it is important that the Council agrees to have this deal objectively assessed by an independent health expert. All councillors will therefore be given the opportunity to vote on that proposition. We are also questioning the propriety of the Conservatives’ behaviour because they did not call an emergency meeting of the Borough's Health Select Committee to assess their deal before they privately shook hands on it and they did not inform any of their partners in the residents' led Save Our Hospitals campaign that were even entering talks. Instead, they spent an estimated £20,000.00 of council tax payers' money on hospital leaflets which falsely claim they have "saved Charing Cross Hospital." It's hard not to see how they are doing anything other than playing fast and loose with public health and public money. Thank you for this update and transparency - I quite agree. And the campaign to save all our hospitals with especial emphasis on Charing Cross and to take the Tory Councillors to task is vital. The www.saveourhospitals.net website has lots of great relevant info. And yes! Let's be there on the 19th!